Printouts you can erase: is the age of wasted ink over? Most of the pages we print out get thrown away straight away; 80% of everything printed is discarded within half an hour, according to Toshiba. That's why Toshiba is taking the same ink that Pilot uses in its FriXion erasable pens and putting it into a laser printer that produces printouts you can scrub clean, so you can save money by using paper again. The first model is a multi-function printer designed for businesses, with a separate eraser unit. The Eco MFP Studio 306LP can print both sides of your document in the erasable blue toner (which helps to remind you that you can erase the paper) says Mills, and you can use any printer paper. What you get looks like any other laser printed document, just slightly paler and with your text in blue. When you're done, you put the paper in the separate RD30 erasing unit, which uses heat and pressure to rub out what you printed. Rather than removing the toner from the paper, it turns it white; if you squint, you can see the shapes of some of the letters under a bright light, but mostly it looks like a blank sheet of paper. Toshiba suggests re-using paper five or six times, but the company's 's Chris Mills says he's been able to run some pages through as many as fifteen times. The erasing unit scans the page before it erases it, and then again once it's done. That means if you erase something you realise you still need five minutes later you can get a copy from the hard drive inside the eraser, but it's also how the unit checks if the paper is clean enough to use again. If you've jotted notes on a printout with a normal pen, they'll still be on the page; if you use one of the special Pilot pens, your handwriting gets rubbed out too. 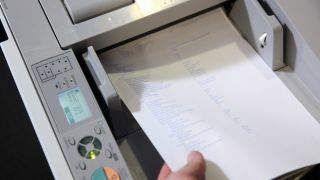 Pages that look clean in the second scan come out in a hopper so you can load them back into your printer; pages with pen marks or where the build-up of toner looks just too messy get diverted to a different paper bin so you don't use them by mistake. These are big business printers that you wouldn't want at home, but if it takes off we can see this being an option for home printing as a separate toner cartridge. Toshiba is also building kiosks you might see at the supermarket or airport soon. The 'recognition scanner' it's making for grocery stores will be able to scan not just barcodes but fruit and vegetables by shape and colour; show it a green pepper and a more expensive yellow pepper and it can tell the difference. It also speaks the name of the produce, so you know it's got it right. We don't know if that will get as irritating as the 'unexpected item in the bagging area' complaints from current supermarket scanners. Toshiba is backing Sony's TransferJet system for copying files wirelessly by touching your phone or tablet against another device. (Think of it as a combination of NFC and Wi-Fi, except the same connection pairs the devices and transfers the file.) Sony used to have a 'transfer station' for copying images from a digital camera but Toshiba is hoping the new SD card and microSD card TransferJet adapters it will soon start selling for tablets and smartphones will make TransferJet much more popular. The demo we saw let you buy music, ebooks or videos from a kiosk; ideal at an airport so you can take your own entertainment onto the plane. You pick the content you want, then drop your phone or tablet briefly into a slot on the front of the kiosk and the files are copied onto it automatically. Transfer speed is about 100Mb/second, so you can copy a 400MB video file for a full-length movie in three to four seconds. (In theory, TransferJet can reach speeds of up to 375Mbps, but few SD cards can write files that quickly at this point.) So far, the SD and microSD adapters are for Android only, but Toshiba hopes to bring them to iOS and Windows as well. When you plug them in to your phone or tablet, the driver to make the card work loads from the card itself, so setup is easy. The content from the kiosk, or any other TransferJet device, copies onto the SD card initially, but the transfer utility lets you choose whether you want to save it onto the SD card or into internal memory. That means you can add TransferJet to an existing device – unlike NFC which has to be built in by the manufacturer if it's going to let you copy files.